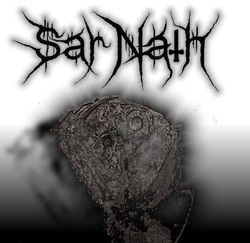 "Grim musings of the seething undead"
A sinister, stark, malicious black metal catharsis...Sar Nath changed names (from "Skarnek", which referred to a surgical scar, as well as an alter ego from a wretched time in the artist's life that had to be killed-off) just in time to write new material and go into the studio before 2014. The key word is "dark", and as a clinically diagnosed agoraphobic with psychotic tendencies, writer/performer "Lord Sar" uses the material as a catharis. Often described as DSBM, the black metal frequently becomes furiously paramount - reliving the horrid past with frustration, traumatized exclamation, while lamenting current irreparable pains and damage. Suicidal, intense, mournful sorrow...steeped in bloody sentiment. "Excreting the inner disgust that poisons slowly"
and the original music/lyrics/logo involved. Having been a pseudonym/stage name of the artist before the change from "Skarnek"
it was a logical step; despite any similar-minded metal bands.